Fly to Amsterdam and transfer to Arnhem where you embark your ship, Amadeus Royal. Early this evening you’ll depart and cruise towards Cologne. Enjoy a welcome reception and dinner on board tonight. Arrive in Cologne around midday with the afternoon to explore. Stroll through the narrow streets and alleys of the Old Town, and visit the Gothic cathedral, dedicated to the city’s patron saints. Inside, you can see the Shrine of the Three Kings, a 13th century, jewel-studded golden sarcophagus which contains the crowned skulls of the Magi. Three crowns also appear on the city’s coat of arms. Depart during dinner and cruise through the night towards Koblenz. Arrive before breakfast in Koblenz at the confluence of the Rhine and Moselle, on one of the dates of the traditional Rhine in Flames celebrations. 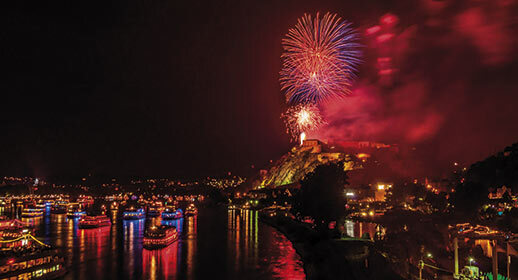 Every year, this illuminated ship parade and fireworks spectacular takes place at some of the most scenic locations on the Middle Rhine and as you’ll remain moored here for the day and most of the evening you can observe the passing flotilla and enjoy the firework display. Plus there is usually plenty of celebrating going on ashore – perhaps wine tasting, live music and dancing. Meanwhile, this morning you may like to join an optional walking tour of Koblenz. Or go exploring independently and discover the attractive riverside promenade and several historic churches, all set beneath the Festung Ehrenbreitstein citadel set on top of the hill. This evening you can observe the passing flotilla and enjoy the spectacular firework display. Your ship will depart Koblenz just before midnight and cruise towards Rüdesheim. Your cruise continues today through the UNESCO-listed Middle Rhine passing the fabled Lorelei Rock, to the charming wine town of Rüdesheim,where you’ll arrive late this afternoon. This evening, perhaps visit one of the ‘olde-worlde’ taverns in the famed Drosselgasse for a glass of local beer or wine. Alternatively, join an excursion – included for passengers on the August 9, 2018, departure – that visits the extraordinary Siegfried’s Museum of Mechanical Music, to see – and hear – an eccentric collection of self-playing instruments! Early this morning your ship will sail to Mainz. Here you can explore the atmospheric Old Town and famous Gutenberg Museum, dedicated to Johannes Gutenberg. Born in the city he was the inventor of the ‘moveable type’ printing press that made the production of books quicker, easier and cheaper and so is known as the ‘father of modern printing’. This afternoon, an included excursion visits the home of Germany’s oldest university, the city of Heidelberg. Highlights include the Old Bridge across the River Neckar and the ruined castle high above the city. It’s rather random appearance is due to it having been added to through different periods of German architectural styles. Virtually destroyed by lightning in 1764 it was cannibalised by locals who used stones from it in their own houses! Meanwhile, your ship will sail to Mannheim where you will rejoin her before she sets off again overnight towards Strasbourg. You’ll arrive early in the beautiful capital of Alsace, with the whole day to discover its cobbled streets, picturesque half-timbered houses and magnificent cathedral. This morning an included city tour and canal cruise will help you get your bearings, then this afternoon you can explore further independently. Alternatively, you might like to join an excursion to the pretty walled city of Obernai, where you can stroll along the ramparts and admire attractive 13th-century buildings with flower-filled balconies. Your ship departs for Breisach early this evening. You’ll have a day to explore Breisach, an important medieval town of the Holy Roman Empire during the 16th century. It’s situated in the beautiful Rhine Valley and known as the ‘gateway to the Black Forest’. You’ll have time to wander through the cobbled streets of the old town and see the impressive 12th-century Romanesque cathedral, St Stephan’s, set high on a hilltop above. A choice of optional excursions is available. You’ll have the chance to drive further into the Alsace region of France to visit picturesque Colmar with its well-preserved old town. Alternatively, you can travel into the heart of the beautiful Black Forest and visit Lake Titisee for a short cruise and lunch. Late tonight Amadeus Royal will depart Breisach and cruise to Basel.